Jesus, can we dream together? At your fingerprints on my heart. You have proven yourself faithful in every way. We have had so many adventures together. I have loved discovering your heart in tiny, beautiful glimpses of life. Jesus, I am so glad I got to run to the ends of the earth with you. Is an experience I would not trade for all the riches of this world. You have met me for morning coffee and late night worship nights. Here at school or by the shores of the Sea of Galilee. Jesus, I love our dreams. I love our adventures. I am so grateful for what you have done. But can I ask for more? Jesus, I want more of your presence, everyday, always, forever. Blow me away with the power of your Holy Spirit. Can we go on more adventures together? And bring your overwhelming joy to the absolute ends of the earth. Can we dream together, Jesus? You make the impossible possible in the wildest ways, far beyond my imagination. Thank you for always out dreaming me. The Lord has recently been challenging me to look for his heart before looking for his hand. Throughout the Old Testament, God's heart is clearly for three things: justice, mercy, and all people. Jonah: God sent his very reluctant prophet to a city and a nation that was completely different religiously, culturally, and morally. This nation was one of Israel's greatest enemies. Yet God saw their humanity; he saw the souls of those who bear his image. God's heart and compassion for all people is reflected so beautifully. Jonah 4:11 "But Nineveh has more than a hundred and twenty thousand people who cannot tell their right hand from their left, and many cattle as well. Should I not be concerned about the great city?" Micah 5 and 6 "And what does the Lord require of you? To act justly and to love mercy and to walk humbly with your God." Micah 6:8 is quoted so often. However, Micah 5 has some of the most beautiful Messianic prophecies. Micah 5:2 states, "But you, Bethlehem Ephrathah, though you are small among the clans of Judah, out of you will come for me one who will be ruler over Israel." Again, we see the reason that we should be seeking justice and mercy is because of what Christ has done. Justice and mercy meet in perfect harmony at the foot of the cross. Yet before the cross, there was the manger. The baby in the manger, perhaps born among unclean animals and visited by unkempt shepherds and foreign magi, has come to make all things and all people, clean, perfect and new. Luke 2:10 But the angel said to them, "Do not be afraid. I bring you good news of great joy that will be for all people." Seek justice for and show mercy to all people, all nations. That is the heart of God. Have a blessed Christmas seeking the heart of our Lord! I grew up in AWANA singing "I will enter his gates with thanksgiving in my heart, I will enter his courts with praise!" This song would get faster and faster until we would all collapse exhausted. Today, I was looking at the context of these lyrics in the Psalms. Psalm 100: 4-5 "Enter his gates with thanksgiving and his courts with praise; give thanks to him and praise his name. For the Lord is good and his love endures forever; his faithfulness continues through all generations." Thankfulness is not dependent on circumstances. The author of this Psalm commands us to be thankful simply for the character of who God is. God is good. He is loving. He is faithful. That is enough reason to be thankful. God has been showing me that I deserve nothing from him. No sacrifice is to big to make for him. It is reasonable to expect or deserve certain things from other people: they are my equals. But God is above all things, and simply the privilege of knowing him is far beyond what I deserve. Everything that I have beyond that is an act of grace. Just last week, I wrote about waiting. Waiting for the future. Waiting for direction. Waiting for excitement. Well, just today, God did the impossible. I have been in the midst of the student teaching application process for several months now. Within a week, placements in Turkey and Israel fell through. I was discouraged and wondering what God was up to. It has been pretty clear to me and the professors I am working with that this is the direction that God is leading us in. On Wednesday morning, I sat down with my Bible and coffee like I do every morning. I (finally) decided to get over myself and told God that if he wanted me to stay, I would stay. This was giving up a dream. Yet God gave it back to me as soon as I was ready to walk in surrender. Later that afternoon, I got an email saying that a school in Morocco was interested in placing me. I got the confirmation email today. 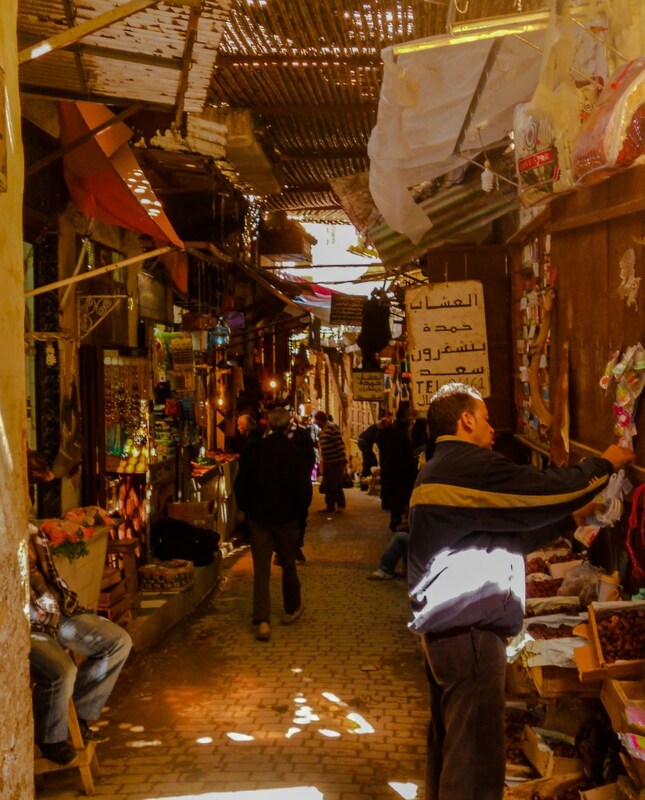 Next fall, I will be student teaching in Morocco!!!!!! Morocco is 99% Muslim and is in the 10/40 window. For the past year, it has been my dream to "preach the gospel where it has not been preached before." This is a God-honoring dream - we are commanded to "Go to the nations." Yet any dream that rises about the desire for God himself no longer brings him glory. Surrender your dreams. Sometimes He gives them back. Sometimes he doesn't. But he is always good. This is a picture of a market in the city where I will be living for two months next year! Isn't it beautiful? Photo not mine. I haven't written for a while. I suppose I could blame it on busyness - senior year has been a tad crazy. The actual reason is because I am in a transitional season, and they are not very exciting! I am so close to getting on the mission field. So close to "actually making a difference." I would so much rather write about incredible victories, profound insights into the Word, or deep Gospel conversations. I would so much rather be "in the nations," using education as a tool to share the gospel in closed and unreached countries. Being in school, in America, surrounded by people that mostly look and believe similarly to me is so difficult for someone who is called to go. The concept of home is so fuzzy because I really don't know where I will end up. Recently, plans to student teach in Turkey fell through and I currently do not know what continent I will be on a year from now. But God does. I love the topic of calling. I believe that not enough people are walking in obedience to their calling. But in this season, the Lord is calling me to take a step back from my calling and to take a step into intimacy. The Lord has been challenging me to abide in him, to seek him for relationship first and answers second. To read scripture not as a to do list but as a way to know the heart of my Abba Father even better. To practice being still in the presence of the King. How can I expect to tell the nations about One I am barely acquainted with myself? David is such a beautiful example and inspiration for this. His calling was made so clear. He was the anointed one, filled with God's spirit and covered with God's promise. Yet he had a long season of waiting where he was little more than an outlaw! He penned the words of one of the most beautiful Psalms: Psalm 37. This Psalm has spoken to my heart in such precious ways lately. The present may seem mundane and the future is unknown, but God is still God. Wait for him. Trust him. Take delight in His presence. And wait for when the Lord works so powerfully that we cannot comprehend what just happened. God dreams differently than I do; usually not with as quick of fulfillment or perhaps with a different method, but Beloved brothers and sisters, God's dreams are far bigger than ours. We cannot fathom what the Lord's ideas of fulfilling our hearts' cries looks like. The Lord has often given me words to sit with for a certain length of time. For a long time, my word was perseverance. Recently, it was more. Now, the Lord has given me the word "obedience." The Lord has been calling me out of my comfort zone and into radical obedience. Often, the thing that most hinders obedience is fear. Knowing that fear is not of God, I would often struggle with guilt for being nervous about something. This is not the heart of God. Throughout scripture, God never speaks against people who are nervous. However, he has very strong words for the one who lets fear hinder himself/herself from the race they were called to run. In the Old Testament, the Israelites are commanded to take possession of the land of Canaan. When the spies brought back reports of giants, the people chose to let fear dictate their choices. This lack of action or obedience brought disastrous consequences. Every person twenty or older would not ever have the chance to experience God's full blessings. I am currently nineteen, but the vast majority of my friends are a few years older than me. I can only imagine what it would be like to know that none of your friends would ever see God's promise be fulfilled. However, this is the consequence for letting fear get in the way of obedience. We see another example of this in the New Testament in the parable of the three servants. They were all given something to invest for their master. The first two servants showed obedience - they did what they were told and it yielded results. One more than the other, but both were obedient to their orders. The third servant was too afraid of losing what little he had to take a risk and be obedient. This passage always reminds me that God loves a heart that is willing to take a risk and possibly lose everything for the gospel. This morning, I was reading in Luke and stumbled on this verse, ""Do not be afraid, little flock, for your Father has been pleased to give you the kingdom." We have no need to be ashamed. We are filled with the power of the Holy Spirit. We are warriors for the Most High God, and He desires to expand His kingdom! Carry a kingdom presence. Do not let your fear stop you from being the obedient kingdom warrior you were created to be! Why study Judaism as an Evangelical Christian? After our Jewish festival VBS, one member of our team received some negative feedback from someone in the community. We are not Jewish, so why are we teaching about the festivals? 1. Judaism helps us understand the Old Testament. As a whole, the church largely ignores the Old Testament with the exception of a few stories that work well in a colorful children's Bible. This should not be! The Torah, the first five books of the Old Testament, provides the foundation of our faith! God creates the world, people mess it up, but God provides a plan to redeem those who love him. The church really doesn't study books of the Bible like Leviticus often at all. But the Jewish people spend their entire lives studying the Torah. Their wisdom and insights are so needed in the church. 2. The resilience of the Jewish people helps me understand the heart of God for his people. The very fact that the Jewish people have kept their identity for over 4000 years while facing so much opposition from every surrounding nation is nothing less than a miracle. The story of the Jewish people helps me understand how God is a God that never stops fighting for children. 3. The dedication of the Jewish people to their faith is inspiring. This week, as we celebrated the festivals, I realized that they are not easy! Passover has so many little details to prepare and keep track of. Keeping Sabbath requires sacrifice. Living in a booth over Sukkot for an entire week takes commitment. However, their identity as a people and their worship is so closely intertwined that this making those choices is second nature. I would love to have my identity so wrapped up in my faith that I would not mind making every sacrifice to honor HaShem. 4. Jesus was Jewish. I am at least a little bit curious to understand how my savior lived and interacted during his time on earth. How did he worship? How did he celebrate? What was life like? Jesus is mentioned many times as "Rabbi" so he knew and understood Jewish laws and traditions quite well. If that was important to our Messiah, it should be important to us as well. This week has been pretty hectic. Shortly after returning from China, I started teaching Vacation Bible School in the morning and working at a daycare in the afternoon. Word of wisdom: Don't do VBS and daycare in the same week. Anyways, this year's theme is Old Testament festivals. 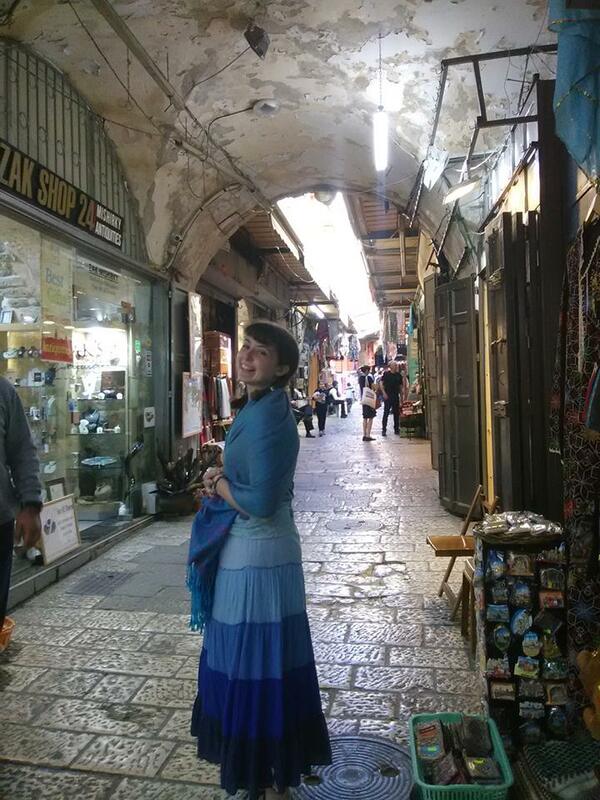 It has been so much fun to dress up like a Jewish person and invite the children into a completely different world. Today we were studying passover. In the preparations, I started to regret deciding to organize and run a passover ceder for 120 small children. In addition, a poorly timed food processor situation made life a bit more complicated. Psalm 118: 21-27: I will give you thanks, for you answered me; you have become my salvation. The stone the builders rejected has become the cornerstone; the Lord has done this, and it is marvelous in our eyes. The Lord has done it this very day; let us rejoice today and be glad. Lord, save us! Lord, grant us success! Blessed is he who comes in the name of the Lord. From the house of the Lord we bless you. The Lord is God, and he has made his light shine on us. With boughs in hand, join in the festal procession up to the horns of the alter. I had been reading Psalm 118 for years and knew that the cornerstone verse was Messianic. Who knew that HaShem(Hebrew name for God, literally translated, "the name") would be so intentional as to set up pieces of scripture thousands of years before the Messiah came to so beautifully describe the coming of Yeshua. 'Blessed is he who comes in the name of the Lord." This sounds suspiciously like the triumphal entry. When Christ rode through the gates of Jerusalem, he entered through the Mercy Gate. This gate was the same gate that the Passover lambs would enter as unknowingly walked their final last steps to the temple mount. "The horns of the altar." Four horn-like shapes protruded from the horns of the altar. Animal horns could be used for many things. They could be made into shofars to announce the arrival of a king or rally troops in warfare. They could be filled with oil to anoint the next ruler. Yeshua, God's anointed one and king of the world was still required to have contact with the altar. Those four horns show how the king of kings would one day be offered up by sinners for the transgressions of the world. I love how in the midst of chaos (and let me tell you, a passover meal with 120 small people is chaotic at best), HaShem finds a way to draw me closer to himself. All of scripture is yet another revelation of his heart for the world. So study the Old Testament. Late Saturday night, I returned home from an incredible trip to China. We got to see God work in many ways. However, usually when you go somewhere to bless someone, you usually get blessed more yourself. :) This was definitely my experience with my interactions with Chinese believers. One weekend on the trip, our team visited a Chinese church. I learned three important lessons. This church was pretty heavily monitored by the government, but no earthly government can keep God from accomplishing His work. Isaiah 55:10-11 states, "For just as rain and snow fall from heaven and do not return without watering the earth, making it bud and sprout, and providing seed to sow and food to eat, so is my word that goes out from my mouth: It will not return to me empty, but will accomplish what I desire and achieve the purpose for which I sent it." This service was completely in Chinese. My Chinese is limited to "hello" and "thank you" in a pretty terrible accent. Needless to say, I was quite confused except when a familiar hymn was sung that I knew the English words to. But the power of the Holy Spirit is far bigger than language barriers. The prayers prayed in that church were some of the most powerful I have ever heard. God truly has a heart for all nations. In Isaiah alone, some version of "all nations" is mentioned 16 times. God is not a western God. He is not bound by western culture. He is not a white God, no matter what the stock Sunday School pictures of Jesus indicate. He is a God with wild, radical love for people everywhere to call out to Him. Lastly, the Chinese Christians are completely committed to their faith. At this church, people were waiting outside the door of the church almost an hour before the service started in a drizzling rain! Often as a college student, I can barely roll out of bed at 9 to get ready for church, but these brothers and sisters were so eager to lift high the name of Jesus that they stood in line to ensure that they would be able to have that privilege. Pray for the Chinese church. God is doing wonderful things in and through our brothers and sisters across the world. At Shiloh, where the yearly sacrifices were offered before Jerusalem, the people of Israel were required to set aside something special simply for the purpose of sacrifice. This clay pot had one purpose: to carry the sacrifice and to allow the fragrance of atonement to fill the air. This pot was consecrated for something special. Yes, it was broken at the end, but this pot was a key part in the reconciliation of an Israelite family with YAWEH. This pot did not have a comfortable, normal life. But this pot had a purpose - the story was not about the pot; it was about the work of the sacrifice it carried. The Lord has been showing me that I am like this pot. I carry the power of Jesus - the sacrificial lamb inside of me. And life is painful - I will be broken. But the story is not about me. My purpose is to live a life of sacrifice so that the fragrance of Christ's perfect atonement might fill the air. I am consecrated for something special - I do not want to live a comfortable normal life. I do not want my life to be about me. May I always remember that I am merely a vessel for the power of the perfect sacrifice to reside in. 2 Corinthians 4:7: But we have this treasure in jars of clay to show that this all-surpassing power is from God and not from us. 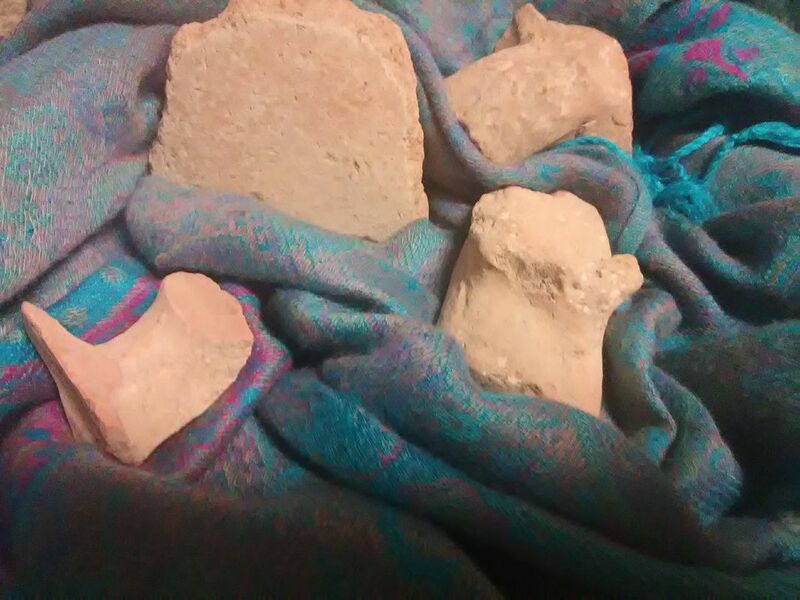 *Pottery shards from Shiloh - at least one of them is from the Judges era and may very well have been part of an Israelite family's sacrifice! My name is Jacquelyn Lofstad. I am a senior music education and history major with a passion to see the name of Yeshua lifted high through the Old Testament!